Chankanaab (meaning “small sea“) Lagoon offers a beautiful beach, but what you’ll stop here for is the snorkeling (or diving). You can jump right in and explore limestone caves which lead to the lagoon. 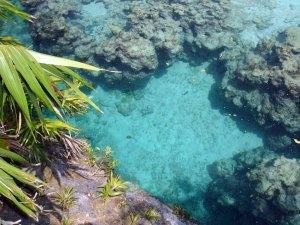 Chuck full of thousands of tropical fish, Chankanaab is a must see. While one of you makes use of the full-service beach, the other can snorkel till their hearts content. There’s a botanical garden here as well. Make sure you plan at least half a day at Chankanaab. Since the cruise ships bring bus loads of passengers here, make sure you arrive early to avoid the crowds. You can rent snorkel and dive gear here. There’s a reef a few hundred feet out (almost too far and too deep for snorkeling). A ship was sunk here to create an artificial reef a few years ago. Cozumel is very sunny, so bring plenty of sun screen. Don’t spoil a great vacation with sunburn. Where do the locals go and which beach has live music?